The free pass that a German girl flashes as she boards her school bus every weekday comes courtesy of the digital transformation that is sweeping through her local government. The teenager applied for the pass via a new digital system set up by Bentheim County, Germany. Eligible students—or more often, their parents or guardians—can sign up online for free student bus transportation by using Esri’s Survey123 for ArcGIS. The county recently launched the digital solution to reduce the bureaucracy and eliminate the paper work involved in processing applications for free bus passes. Integrating GIS technology streamlined the process from beginning to end—from gathering information through an online survey to checking students’ eligibility for the passes to calculating transportation distances. Families fill out the online survey using any desktop computer or mobile device, since Survey123 for ArcGIS works with all web browsers and devices. They enter the student’s name, date of birth, address, and preferred school, then upload a photo for identification. 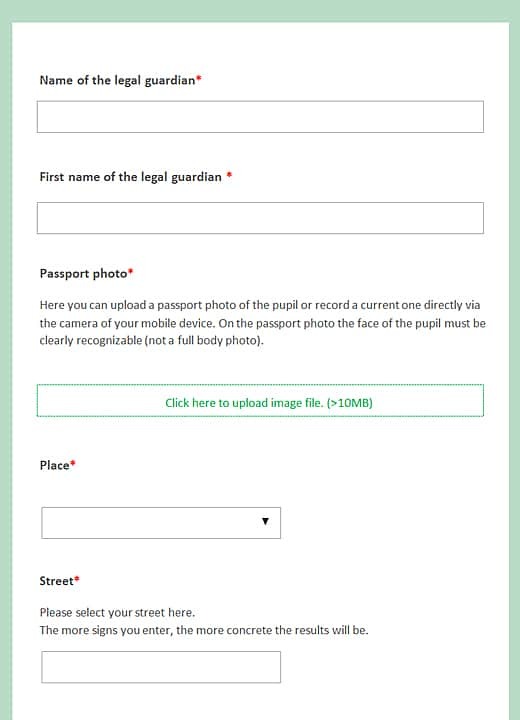 On a mobile device, the photo could even be a quick selfie taken as the form is filled out. Students on their way to school board a bus in the Bentheim area. Some students can now apply for free bus passes online using Survey123 for ArcGIS. Photo by Anja Koch, Nordhorn. Every year, 5,000 students in Bentheim County—a rural area that borders the Netherlands—apply for free bus passes to attend their local schools. Requesting a bus pass typically involves parents filling out paper forms and county staff executing a multistep, labor-intensive approval process. 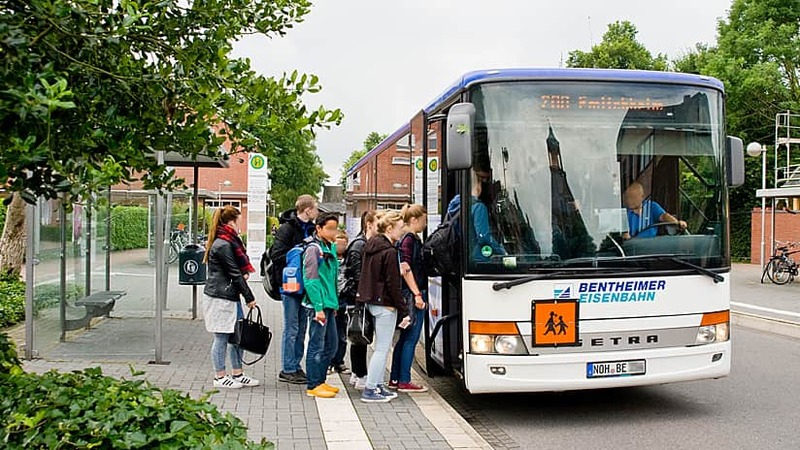 To make applying for and processing requests for the bus passes easier, Bentheim County and Esri Deutschland, Esri’s distributor in Germany, began collaborating on a project to transform the bus pass system in 2016. The goal was twofold: to simplify the application process for students and reduce the time county workers spend processing applications. In May 2018, Bentheim County launched a pilot program with about 500 students to test the new Survey123 application with automated processing. Bentheim County was already familiar with ArcGIS, so Survey123 for ArcGIS was an obvious choice to use for the pilot program. The county administration uses ArcGIS every day, taking advantage of an enterprise license agreement for state and local government without having to purchase additional software. Most of the county’s data is stored centrally in an enterprise geodatabase. 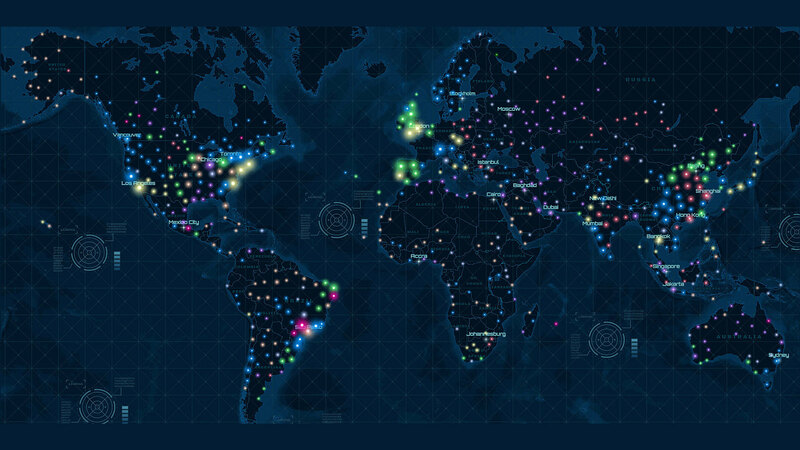 Access to, use of, and editing of the data is done through various Esri applications like ArcMap, ArcGIS Pro, ArcGIS Enterprise, ArcGIS Online, Collector for ArcGIS, and Survey123 for ArcGIS. “Our administration has been working with ArcGIS technology for 17 years and learned about the capabilities during this time,” said Frister. With Survey123, they can capture the data more quickly, digitally, without errors, and directly into a format that can be automatically processed by ArcGIS. Another reason Bentheim County decided to use Survey123 for ArcGIS is that the ticket application process involves collecting sensitive personal data. Using the secure environment of ArcGIS Server for hosting a feature service that contains and processes such data was essential. 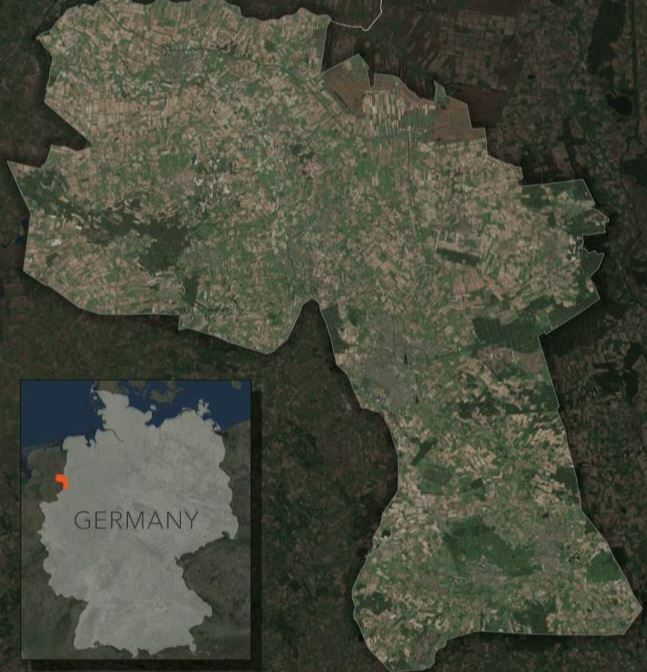 Grafschaft Bentheim (Bentheim County) borders the Netherlands. Map by Jennifer Bell, Esri. In Bentheim County, school transportation is provided by private bus companies rather than a dedicated fleet of school buses. Accurate calculations directly affect the county budget, since the county is responsible to reimburse the bus companies for all eligible student tickets. Students in first through tenth grades for general education, eleventh and twelfth grades for special education, and some career and vocational schools are eligible to have the cost of transportation covered by the county as long as they attend the closest school and live at least two kilometers—or 1.25 miles—from that school. Using the manual process, student applicants pick up a paper form, which they fill out, sign, and mail back to the county with a passport photo. County workers then enter the information into a database by hand; scan, crop, and save the photo as a .jpg file; calculate each student’s distance from their school; and determine if they are eligible for a bus pass. Finally, county staff mail a positive or negative answer back to the student. It typically takes four to five weeks to process an application this way, and it can take up to six weeks during busy times. Students or their parents or guardians apply for free bus passes by filling out a simple form. The new Survey123 process, along with calculations made using a Python script, eliminates the need for paper altogether by automating those time-consuming steps. 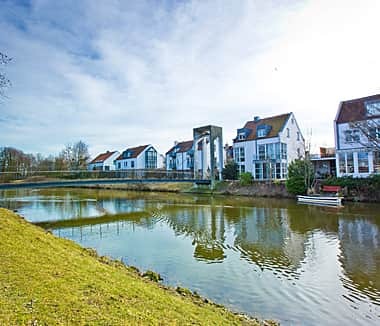 Frister worked with Sven Harpering, local government solutions engineer for Esri Deutschland, to develop and customize the survey according to the needs of the student transportation system. The Survey123 form was published using the Survey123 Connect tool, so it can easily be edited if modifications are needed. The form is also dynamic, displaying smart form options for the address fields that agree with local databases. For example, if a student selects an area, a drop-down menu appears with a list of streets that are in that area. Once a street is selected, another menu appears with a list of all possible house numbers on that street. In another example, when a student enters their grade level, only schools offering that grade level will appear in the next survey question. This function of Survey123 for ArcGIS helps families avoid accidental errors when filling out the form. When the completed form is submitted, an almost entirely automated workflow is triggered. 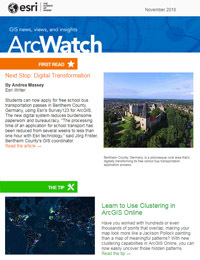 The student’s information is transmitted and written directly to a feature service that is registered at the ArcGIS Server. Next, an ArcPy Python script—which runs once an hour—processes the data and makes calculations to check if the student meets the eligibility requirements for a bus pass. Based on the address and the school selected, the distance between them is calculated with ArcGIS Network Analyst. 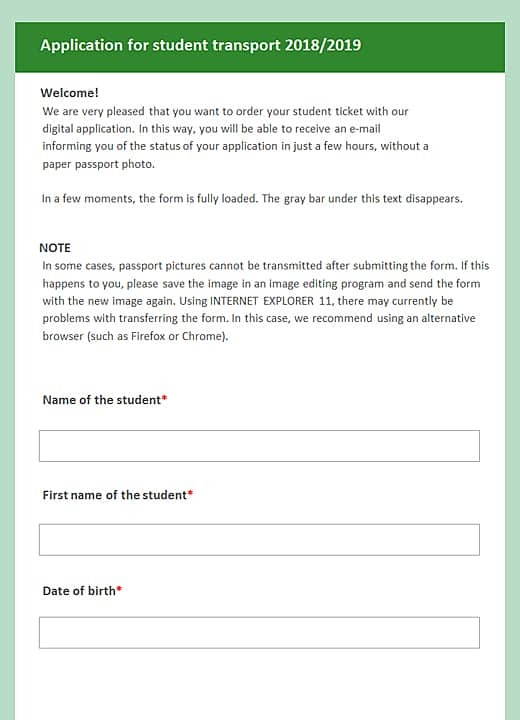 If the student meets the requirements, all relevant information needed to issue the student ticket is written to another feature class, and the ID photo is stored as a .jpg file in a directory. File names are automatically generated using the student’s name and date of birth. All information is then sent to the relevant bus companies. The time-saving process ends with a personal touch as teachers hand out the tickets individually to their students at the beginning of the new school year. The survey collects information such as the student’s name, the legal guardian's name, the student's address, and a passport photo. This year, the new digital workflow launched to about 500 students. Bentheim County advertised in a local newspaper, explained the program on the county website, and communicated with a small selection of schools from three local communities, inviting them to join the pilot program and try out the online application. Most students apply for bus passes in May for the following school year, meaning the application collection phase of the pilot program has passed, though the county will continue to accept applications. To date, the overall response to the program has been positive, and the county hopes to gather more feedback from people who have used the survey form. Next year, Bentheim County plans to use the digital application in all seven of its municipalities. The final goal is to reach all students who apply for bus passes, which means between 3,000 and 5,000 applications per year would be replaced with this more efficient process. It may take time to roll out the app to all students, but the hope is that the need for paper will eventually be eliminated. Thousands of students from neighborhoods in Bentheim County are receiving free bus passes via a system that uses Esri technology. The GIS department impacted the county’s digital transformation beyond traditional GIS tasks—in this case, streamlining an entire workflow from beginning to end. Harpering also notes that the new process has a modular structure that could easily be transferred to other counties that might want to digitally transform their student transportation system, thus broadening the potential impact of the project. As part of the preparation for the pilot program, Jörg Frister built a presentation featuring the student transportation project. This presentation was showcased at several events like the IP SYSCON 2018—a conference on GIS and operational management hosted by Esri partner IP SYSCON—and local government road shows in various German cities. Andrea is a writer specializing in creating web content for Esri.com. 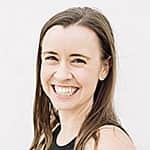 She’s fascinated by how writing integrates with UX/UI, and passionate about communicating what Esri is all about to anyone new to GIS. Andrea got her start writing a travel blog while working as a trombonist on cruise ships. Years of international travel established her love for (and daily reliance on) maps.